Sir Charles Santley at the age of 69. Several pedagogical theories exist with regard to the training of brightness and darkness in a voice, or what is known as chiaroscuro. the use of strong contrasts between light and dark, usually bold contrasts affecting a whole composition. It is also a technical term used by artists and art historians for the use of contrasts of light to achieve a sense of volume in modeling three-dimensional objects and figures. a proper balance of fundamental and upper partials in the tone. Do we brighten first, and darken later? Do we darken first, and brighten later? On either side of this argument we have two gentlemen: Giovanni Battista Lamperti and Manuel Garcia, Jr..
From the available literature written by both, it would appear that Francesco and Giovanni Battista Lamperti taught a dark tone first, then brightened it. This darkness appears to be associated with an expanded pharynx and a lowered laryngeal position. Many 21st century pedagogues still advocate for this pedagogical approach. In his presentation “Out of the Darkness into the Bright” (found here), Stephen Austin advocates a dark timbre first which later is brightened, staying in line with the Lamperti tradition. In opposition to the Lamperti’s “dark-then-bright” approach stands Manuel Garcia. 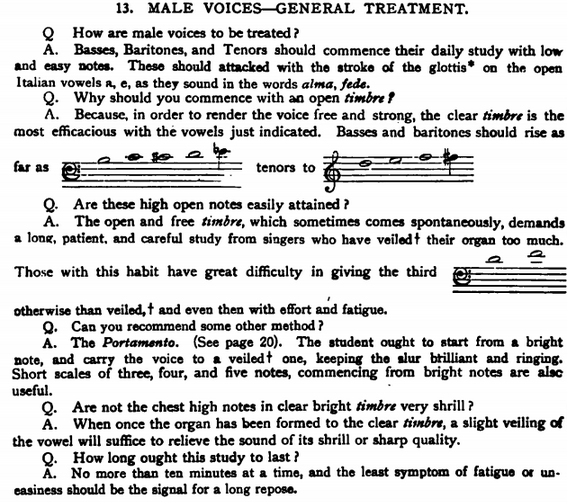 In Hints on Singing (1894 – see screenshot below), Garcia’s first exercise for men was the exact opposite. For him, the male voice was to begin with coup de glotte in chest in a bright, open timbre and ascend to the top of the chest register. When asked why he started in open timbre, Garcia said it was to render the voice “free and strong.” For him, the approach was bright first, sombre/dark later on. In fact, coup de glotte tones in a bright chest voice were his first area study in a man’s daily vocal study. Too dark or veiled upper notes should be brightened with portamenti from bright lower pitches to upper veiled ones. It is so interesting to me to view these two pedagogical approaches side by side. Epidemiologically, I find it intriguing to trace which approach has endured into the 21st century. There are definite timbral results from these two approaches, and the results of this work SOUND very different to the ear. My personal preference is to use Garcia’s approach. The male voice (especially baritones and basses) can be naturally dark, especially after puberty when the singer’s new low voice begins to be developed. When exercised in gentle, delicate coup de glottes in bright timbre, male voices take on a youthful, vibrant, flexible, and firm sound. The voice also ‘speaks’ more easily, and clarity of vowel can be assessed. What functional issues would a ‘dark approach’ cause in the vocal mechanism? In darkening the voice as primary practice, tensions in the pharyngeal wall (the inferior constrictor) can cause registration issues in the transit from chest voice to middle and upper voice. This constrictor attaches in the front of the larynx to the thyroid and cricoid cartilages, near the location of the cricothyroid muscles (the stretcher of the vocal cords, or CT). The difficulty of transit through the passaggio is caused by pharyngeal wall tension, which is traveling to the front of the throat and causing either a choking behavior (a primary function) or an audible break in the voice. It is important to recall the primary function of the stretchers is swallowing, and vocal maneuvers that institute disproportionate tension in an attempt to ‘override’ primary function cause sensations of choking or strangulation, i.e., a ‘strangled tone.’ Constrictor tension could also explain why darkened voices have difficulty singing in the passaggio, higher notes (i.e. no top voice), and sing repertoire in vocal classifications to which they do not natively belong. By developing a bright male chest voice with little or no pharyngeal wall tension as Garcia describes, the tone can be developed in a way that does not call upon the action of the back wall of the throat or interfere with the workings of the stretcher muscles of the larynx. Starting in bright timbre can then be followed with agility patterns over seconds, thirds, fourths, and fifths, thereby coupling brightness with easy laryngeal movement. This approach may explain why so many of the earliest recorded singers, both male and female, sang with such bright, limpid voices. Of course, the pedagogical preference of any teaching is ultimately the choice of the instructor. All should understand the reasons why any vocal maneuver is being taught, and understand its short and long term implications on the voice. My aim with this article was to highlight the different historical methods, and give an explanation of my particular approach, based upon a knowledge of vocal function.